There’s no denying the damaging effects of UV rays, and the constant need to apply SPF protection whenever you’re out and about. And even then, prolonged periods under the sun can still be harmful, which is why added protection is always a good idea. In comes visors, because caps and hats just aren’t trendy enough, while visors still serve a similar function. But because no any ordinary visors would be good enough for you guys, here are three from the likes of Chanel, Dior and Louis Vuitton. First up, Chanel’s version (SGD990) which comes in tweed and mixed fibres. Tweed is a lightweight material that has a casual, sporty touch to it, the perfect visor while you’re out golfing on the weekends. It’s also a recognisable signature at the Parisian luxury house, one that was first adapted for women’s RTW by Mademoiselle Coco Chanel way back in the 1920s, a timeless fabric that’s still used in Chanel’s collections till this very day. Next, Dior’s avant-garde DiorClub1 (SGD580) which has become a cult classic of the brand ever since it made its debut on the Spring-Summer 2018 runway show. Several seasons later, colours available have expanded to include pieces in Black, Orange and Yellow, alongside the originals which you can see here. Each piece comes with an elastic, woven band that comes embroidered with the Christian Dior font for a truly luxe vibe. 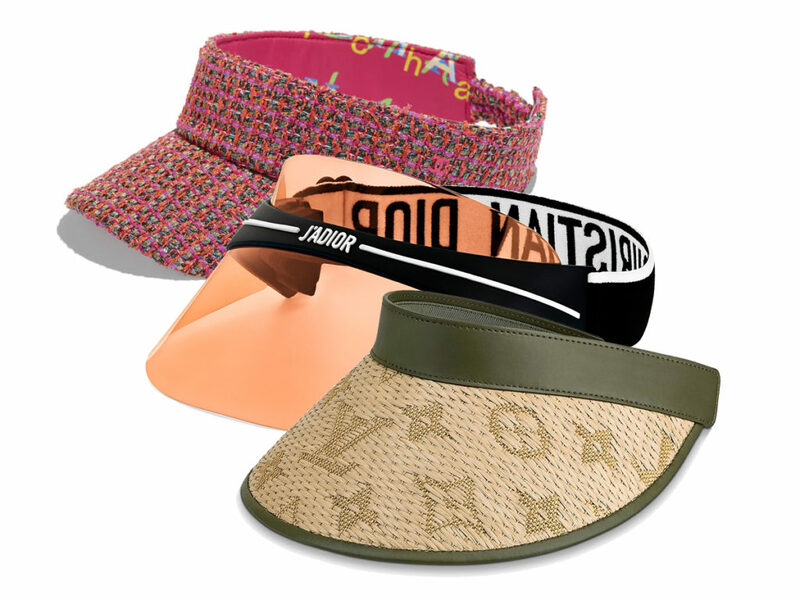 Rounding up the trio is Louis Vuitton’s Strawgram Visor (SGD1400) that’s also the priciest of the lot. This could be attributed to the fact that the visor is expertly woven from raffia, to form the house’s signature monogram pattern, a feat that demonstrates the expert craftsmanship at Louis Vuitton. Finished with a khaki leather trim and headband, this visor is available in 2 sizes, which should fit both men and women. Get protection, but always remember to do it in style.